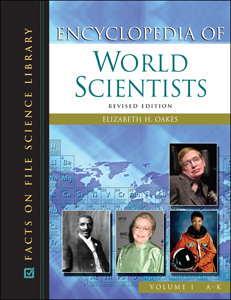 Encyclopedia of World Scientists, Revised Edition is a diverse and comprehensive two-volume collection of biographies of scientists. This essential work contains fascinating stories of nearly 1,000 scientistsalmost half of whom are femalewho have contributed significantly to their fields. All scientific disciplines are represented, as well as all periods of history as far back as 600 BCE. With more than 100 new entries and more than 200 photographs and illustrations, this revised edition highlights how scientists have overcome formidable obstacles while in pursuit of great achievements that have forever altered our understanding of the world. While this set brings together an array of well-known and lesser known scientists, the focus is on their work, with their scientific achievements presented in everyday language that makes even the most complex concepts accessible. The well-known scientific "greats" of history are featured, along with contemporary scientists whose work is just verging on greatness. Among these are many minority scientists who have often been excluded from similar books. Entries are organized by field, by country of birth, by country of major scientific activity, and by year of birth. "...a resplendent information bank of scientists for any researcher." "This reference shines for its attention to women...Current and historical coverage makes this an enticing work."